There’s a large number of minerals whose chemistry includes arsenic combined with oxygen: the arsenides. Many of them are very rare or come from some obscure locality that has not produced enough specimens to add significantly to the collector market. 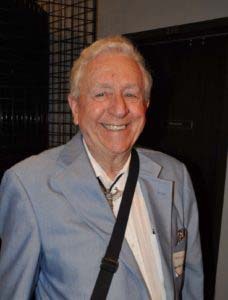 Fortunately, however, there are a significant number that are readily available in quantity to please all collectors. These include adamite, legrandite and mimetite, which have been described in the literature often enough for information on them to be readily available. Historically, a lovely suite of arsenic species was commonly collected in Cornwall, England. Several of them were new species at the time, and enough specimens were found to supply the collector and scientific markets. Some of these specimens still survive today. described in Part I of this series. A serious collector should keep an eye out for them, as they add a historical dimension to a collection. Even today, specimens of these arsenic species can be seen on display, and they may even show up for sale. This leaves us with a suite of very colorful arsenides that is available in quantity today. 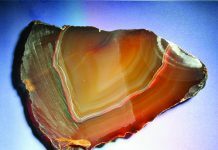 The group includes such beauties as erythrite, realgar, orpiment, and very interesting, but uncommon, scorodite. The first three of these minerals are certainly common enough and are intensely colorful. Scorodite is not as common as the other three, but is found in several noted specimen localities, and this iron arsenate shows a curious color phenomenon. There is some resistance to collecting realgar and orpiment because of the fear of handling arsenic minerals. Keep in mind that any element that has become part of a compound loses its original elemental properties. Fluorite, for example, is composed of calcium and fluorine. Fluorine is the most chemically active of all the elements, capable of causing explosions, and is poisonous in its gaseous state. It killed or maimed some of the scientists who worked to discover it. Calcium is also highly reactive. When combined in the compound calcium fluoride, however, both elements are stable and perfectly safe. We add this compound to toothpaste to help strengthen tooth enamel. The same stability exists with realgar and orpiment. As long as you handle them properly, wash your hands afterward, and avoid breathing in their dust, you will be perfectly fine collecting them. It is a good practice to wear a dust mask when working with them. Realgar and orpiment are constant companions, developing as they do in low-temperature sulfide deposits that are rich in arsenic. One of their unusual features is that they can crystallize from a gas, rather than a liquid solution. These gases escape from fumaroles and vents around active volcanoes and nearby hot springs. When the hot gases encounter cooler surface rocks, they form crystals, without passing through a liquid phase. Such occurrences are more of a curiosity than something collectors seek, since the crystals and coatings so formed are so small that they are little more than colorful dots and smears. One place in which smears of realgar and orpiment are encountered is the old dumps of the great borate deposits in Boron, California. There is plenty of evidence of ancient volcanic activity here. It is not unusual to see evidence of realgar and more often orpiment on specimens of ulexite, colemanite, and so on. The great Yellowstone Park area, which is one of the most active volcanic regions in our country, has countless active hot springs and is a near-surface volcanic site. Evidence of these two minerals, along with yellow sulfur, is found throughout the park. The aresenate specimens collectors seek do not come from hot springs, nor are they found in high-temperature ore deposits that crystallize at temperatures around 300°C. The silver mines at Mapimi, Mexico, are a good example of a location that produces collector specimens. They exploit a low- to medium-temperature metal deposit that, when weathered, produced quantities of lovely arsenates: adamite, legrandite, koettigite, scorodite, cuprodescloisite and others. Several of the Chinese deposits that yield fine realgar and orpiment are low-temperature deposits, as is the Getchell mine, in Utah. other low-temperature species like stibnite, cinnabar, pararealgar and calcite. They occur less often with quartz, and sometimes with sulfur. 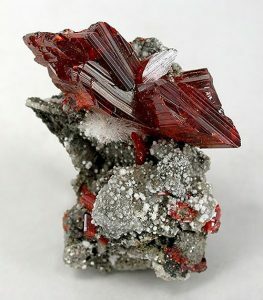 Realgar crystals are composed of four arsenic atoms, which act as positively charged cations, and four sulfur atoms, which act as negatively charged anions. Orpiment, on the other hand, is composed of two arsenic atoms and three sulfur atoms. Neither species is particularly stable over time. Intense sunlight can cause realgar to slowly convert to a more stable form called pararealgar, an orange-yellow mineral that is often seen as a coating or dusting on the realgar. Orpiment also slowly alters, and it is not unusual to find older orpiment crystals with an orange-yellow film. Both species are best kept in subdued light or in a drawer. 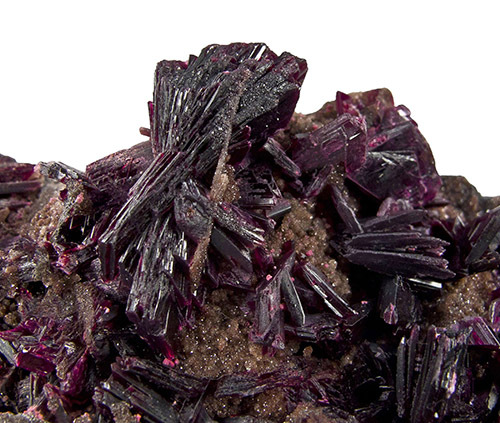 Of all the arsenic species, erythrite ranks high on everyone’s want list. 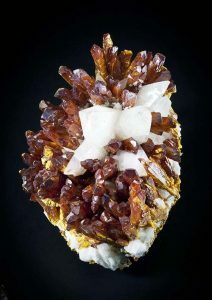 It is certainly not a common mineral, but it is beautiful. Its name is taken from the Greek word erythros, which means “red”. The color of this cobalt arsenide ranges from pink to a lovely violet-red, and shades in between. Chemically, it is a hydrous cobalt arsenate, so it is found where cobalt minerals have been weathered in near-surface ore deposits that are rich in cobalt. Many of the cobalt deposits are also rich in nickel species, and nickel and cobalt can interchange easily. They form an entire series, with erythrite at the cobalt end of the series and annabergite at the nickel end of the series. Annabergite is a pale, greenish color. As nickel substitutes for cobalt in erythrite, the lovely violet-red color gradually changes to a greenish shade. Erythrite has been known for centuries, as it was first encountered in the silver mines in the Schneeberg, Saxony, area of Germany. The specimens from here have remained among the finest erythrite specimens ever found. 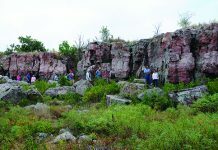 Superb rose-red to violet-red, acicular to bladed crystals as long as 4 inches were once mined here. These crystals have a lovely, pearly luster and show striations along their length. They form in foliated blades that, when parted, are flexible. Thinner crystals can be glassy, with perfect cleavage, and smaller crystals tend to be micaceous. The bladed clusters from Germany were found in fanlike arrangements. Other erythrite from these silver mines forms coatings on matrix. While erythrite is found in a number of cobalt deposits in minor amounts, Mexico has had two good sources near Alamos, Sonora. Most texts report the localities as the San Bernardo and Sara Alicia mines. The erythrite was found mainly as rounded tufts of pale to good pink color, suggesting the presence of nickel in the structure. Specimens were of good size, with matrix specimens measuring a foot across. The finest erythrite crystal specimens in the modern era of collecting have been coming from Bou Azzer, in southern Morocco. These crystals are bladed and up to an inch long, arranged in foliated clusters. Their color can be as fine as the German specimens, ranging from a blush rose to fine violet-red. What makes the Bou Azzer source very exciting is that the erythrite is found with skutterudite, a silvery-white, metallic-looking cobalt sulfide, as well as a secondary arsenic species, roselite, which is well named for its fine color. Roselite forms in crystals that are monoclinic and measure up to an inch long. Roselite was first found in the same Schneeberg, Germany, mines as erythrite. 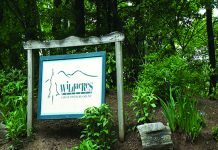 So far, the species that have been described are either abundant now or have come from old, now-closed mines in sufficient quantity to still be available. 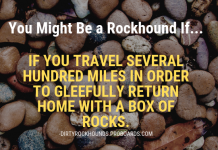 Scorodite, on the other hand, has never been found in quantity. It was first distinguished in the 1800s, and fortunately it has been found in China in recent years. 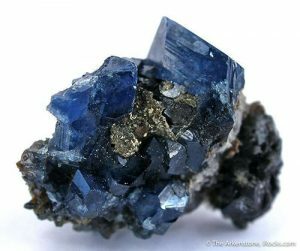 Scorodite has been found in a couple of mines as very fine, half-inch, blue and blue-green crystals. Perhaps the finest scorodite crystals found thus far have come from the Noche Buena mine, in Zacetacas, Mexico, where it was found in fine, deep-blue crystals an inch or so long. The deep second and third oxide zones of the famous Tsumeb mine, in Namibia, have been sources of a most unusual type of scorodite that has what is called an “alexandrite effect”. Alexandrite, a gem form of chrysoberyl, was found in Siberia and named for Russian prince Alexander II. What makes this variety of chrysoberyl unique is that it exhibits two different colors, depending on the type of light to which it is exposed. In artificial light, alexandrite is red, while in sunlight, it is green. Scorodite from Tsumeb shows the same alexandrite effect; in artificial light, the Tsumeb scorodite has a bluish-purple color, but in daylight it is blue-green. The new finds in China are in mines along the border of the Guangxi Autonomous Region and Guangdong province in southern China near Vietnam. It was first discovered in a mine in Hezhou that was opened in 1967. The mine was dug mainly by hand, which tells you how remote this place is. The mine was not successful for long, and closed. It was reopened in 1999 by a local miner, and some amazing orange to orange-red mimetite—China’s finest—was recovered, along with fine scorodite. This two-part article only describes some of the colorful arsenide minerals to be seen in collections today. Handling these arsenic minerals is safe, as long as you follow the common sense rules already mentioned.